Philippe Gilbert will manage Coyote freight brokerage, as well as global logistics and distribution, global freight forwarding, and UPS Freight. Transport and logistics giant UPS Inc. today named a DB Schenker Logistics executive to run its Supply Chain Solutions business line, which includes the Atlanta-based company's Coyote truckload freight brokerage business as well as its global logistics and distribution, global freight forwarding, and UPS Freight arms. 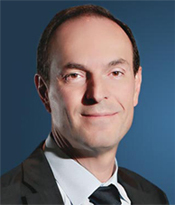 Philippe Gilbert will join the company this month in the newly created position of president, Supply Chain Solutions. He will also join the UPS Management Committee, the company's senior-most leadership group, and will report to UPS Chief Operating Officer Jim Barber, the company said. Supply Chain Solutions is one of three business segments UPS reports on publicly, alongside its U.S. Domestic and International divisions, UPS spokesman Glenn Zaccara said in an email. "Like the other two segments... Supply Chain Solutions involves a large part of our operations, our financial commitments, and the resources and solutions we provide to our customers. As such, it made sense to appoint a single leader within our executive Management Committee at the helm," Zaccara said. Hiring Gilbert is also part of the company's effort to transform its business and culture by blending new leadership with seasoned UPSers to build new ideas and experiences, UPS Chairman and Chief Executive Officer David Abney said in a release. At DB Schenker, Gilbert was Regional CEO of the Americas, leading air, ocean, and land logistics in the U.S., Canada, and eight countries in Latin America. Previously, he was in executive roles with Geodis Wilson—the freight management division of logistics provider Geodis Group—and with Saga S.A., Circle International, and Eagle Global Logistics (EGL). Feedback: What did you think of this article? We'd like to hear from you. DC VELOCITY is committed to accuracy and clarity in the delivery of important and useful logistics and supply chain news and information. If you find anything in DC VELOCITY you feel is inaccurate or warrants further explanation, please ?Subject=Feedback - : UPS names DB Schenker Logistics exec to run supply chain solutions line">contact Chief Editor David Maloney. All comments are eligible for publication in the letters section of DC VELOCITY magazine. Please include you name and the name of the company or organization your work for.